We spent our first three days in Basque Country based in St. Jean-de-Luz on the French side to compare and contrast the Spanish vs. French experiences. Our first day was spent exploring the nearby towns of Biarritz and Bayonne, and we spent our second day on an impromptu road trip adventure to explore a number of quaint towns in Pays Basque. After our time on the French side, we made our way to Spain to delve into the country’s most famous wine region, La Rioja. We knew we wanted to spend time in foodie San Sebastian, but decided that a dose of wine tasting/education would be a good preface to San Sebastian’s gastronomic focus. We were picked up at 9AM at Hotel La Marisa by our driver, Nadege of Ze Chauffeur. Nadege was great with working with me in advance to coordinate our tastings in La Rioja, providing a bit of guidance about what time frames seemed realistic for tastings + lunch in the area. As I mentioned in my initial post about our planning for this trip, wine tasting in Spain is a bit different from what we were familiar with in Napa and Sonoma, our old stomping grounds. In Northern California, appointments aren’t generally necessary and tastings are actually just little tastes of a variety of wines. In Spain, appointments are essentially universally required which means there’s a bit of planning that goes into this process. Unlike wine tastings in California, ‘tastings’ in La Rioja are generally a tasting preceded by a tour of the grounds and processing plants, which is part of the reason there’s typically a charge for tours. This was our first day of wine tasting in La Rioja, and we pre-arranged visits to three different wineries: Marques del Puerto, Marques de Riscal and Bodegas Ysios. The journey from St. Jean de Luz to La Rioja took about two hours but provided a scenic drive of the French and Spanish countrysides. There was clear difference between French Basque architecture and Spanish Basque architecture, with France’s storybook medieval buildings bleeding into fortified towns and Spanish Renaissance architecture. Having a driver during this journey made the experience infinitely more comfortable. Between the four of us and our luggage, traveling by bus or train (with the requisite transfers) would have been cumbersome, and renting a car and wine tasting was an absolute no-no. Working in a transfer and a full day experiencing La Rioja was the perfect solution for us and ended up making the day fun and stress-free for all involved. Plus, it wasn’t just about hiring a driver; Nadege is more tour guide than driver, so she helped narrate a bit of what we were seeing along the way and enlightened us on Basque culture and history as we weaved our way into the Spanish vineyards. 1We chose Marques del Puerto as our first stop because its one of two La Rioja-based wineries that we’re acutely familiar with. We buy the Crianza and the Reserva from our local wine shop in Anguilla on the regular, and the shop owner helped us coordinate this special tasting and tour with Javier Abarca, the Export Manager, who is based in Madrid. The bodega, now a French-owned company, is located in Rioja Alta about 5 miles from Logroño, the capital of La Rioja. We were the only people on the tour, and it quickly became a comfortable family environment. My inclination is that tours and tastings aren’t a normal occurrence here, but they gladly took us in and showed us a few key aspects of the winemaking process and the bottling. We were on more of a time crunch that I had imagined going in: we arrived at the winery at 11AM for our tour and were scheduled for another winery at 1:15PM. Based on my experiences in other regions, I thought this would be sufficient. Not the case (more on this later). We were on-site at the end of their harvest, and watched the final truck of the season bring in a load of grapes from the vineyards for testing and processing. Marques del Puerto is a mid to high-level producer in terms of quantity, with about 5 million bottles of red produced annually. After a 45-minute tour of the grounds and processing facilities, we were ready to taste. We were taken to a classroom-type setting with windows showcasing the gorgeous rustic surroundings. Elsa, who handled our tasting, was an absolute star; the best and most passionate person handling tastings in any of the wineries we visited. She explained the region and discussed every wine in depth so we could understand precisely what we were tasting in each varietal and vintage. We tasted all of Marques del Puerto’s offerings with hefty pours: the Blanco; the Rosado; the Crianza (the young wine, aged a year); the Reserva (aged 3 years); the Gran Reserva (aged 7 years); and finally, the Gran Reserva Special Edition. Naturally, our tastes varied. Their rosé was my favorite of all rosés that I tried from the region. Unlike the rosés that we typically see being produced in France, the rosés in this region were universally darker in color; more pinky-red than salmon-pink. The Crianza and the Gran Reserva Special Edition were my two favorite vintages; Scott voted for the Gran Reserva (my least favorite of the reds). 2We arrived at Marques de Riscal about forty minutes late despite the quick drive from Marques del Puerto. We called to inform them, but nevertheless felt bad about our tardiness. Just like our tour with Marques del Puerto, we were on a private tour with an English-speaking guide escorting us through the property. From the get-go this was entirely different from Marques del Puerto. Located in Elciego, Marques de Riscal is iconic within the La Rioja landscape. The hotel was designed by Frank Gehry, the same architect behind the Guggenheim in Bilbao, and the style is markedly similar. For most, Marques de Riscal is a must-see, not because it’s traditional in any way but rather because its contemporary design draws visitors from around the globe; a stark contrast to many bodegas in Rioja Alta. It’s modern in every sense of the word, and handles large production. Its scale is apparent as soon as you enter: a huge reception area with multiple cashiers, a camera crew filming harvest, a 5+ minute video to show guests the life of the grape and the wine production process, and a great deal of machinery to handle the production that this winery accomplishes annually. Yet, in spite of the modernity, there’s an homage to the roots of Marques de Riscal and the winery’s past. A room on site holds bottles from the 1800s, a bottle from each year that the bodega has been functioning in the region. We completed a circuit and ended in the wine tasting room, already set up for four tasters, with pre-poured glasses of a variety of wines. Doors opened to the outside so we could glimpse the scenery while we sipped. We tasted six total wines, two whites and four reds: the Rueda and the Sauvignon Blanc to start (the two whites), followed by the Crianza (aged 18 months), Reserva (aged 3 years), Finca Torrea, and Gran Reserva (aged 5- 7 years). Marques de Riscal is their Reserva. This is the main focus for them. Out of the 5 million bottles of red that they produce, the Reserva comprises 80%. The Crianza, by contrast, is a new focus for them (started in 2007) as they typically eschewed production of the younger wines. Of the reds, the Gran Reserva was the hands-down winner for me, though I can understand why their Reserva is their bread and butter. My least favorite? The Finca Torrea. After our tasting, we picked up a bottle for the road and made our way out. Our third tasting of the day, a Spanish-language tasting at Bodegas Ysios, was scheduled at 4PM and again, we were already late. Our main objective: see the other-worldly architecture of Ysios. 3We made it. Well, we didn’t really make it, but we showed up about 15 minutes late, so we could attempt to slip into the crowd and try to take in the tour. Bodegas Ysios is located in Laguardia, the town that we would call home for our two nights in La Rioja, making it the perfect final bodega for our first day of tastings. I knew nothing about the wines at Ysios but what I did know was that the architecture was next-level. Marques de Riscal has an indisputable cool modern vibe, but in my opinion nothing holds a candle to Ysios in terms of architecture. It felt like we’d be dropped into an old-school pixelated video game, but the stunning modern architecture managed to fit into the local environment in a strangely perfect way. Bodegas Ysios only produces two wines, so after the tour we headed to their tasting room to try a glass of each. Their tasting room is a stunner with a slight elevation and a shape that mimics the building’s mountain-like facade. For all of us, the aesthetics in the winery were more of a wow factor than any wines we tasted (granted, we had already gone through a full day of tastings without lunch so we may not have been in the best state to appreciate their wines). This is the perfect example of needing to schedule tastings in advance, though. After lining up our wineries and working with two different private tour guides to craft our schedules, I reached out about a month in advance to Bodegas Ysios to schedule a tasting for our party of four. Even with that notice, the only 4PM option was the Spanish language tour, which was a fun challenge for Scott and I (we probably understood 35%), but impossible for our friends who don’t speak Spanish. Regardless, we were thrilled to have put Ysios on our agenda, and would have been happy to just stop and take in the stunning facade if they had not let us join the scheduled tour late. If you’re in the region, this place is an absolute must. The pictures honestly don’t do it justice; seeing it in real life is pretty spectacular. Yes, it’s big and yes, everyone goes, but there’s a reason it’s on visitors’ radar. After Ysios, our first day of tastings came to a close and we settled ourselves into Laguardia-based Castillo el Collado, a castle-turned-boutique hotel that we would call home for two nights. We learned a lot after our first day of tasting, and it was a valuable experience for us going forward for future trips to regions like this. 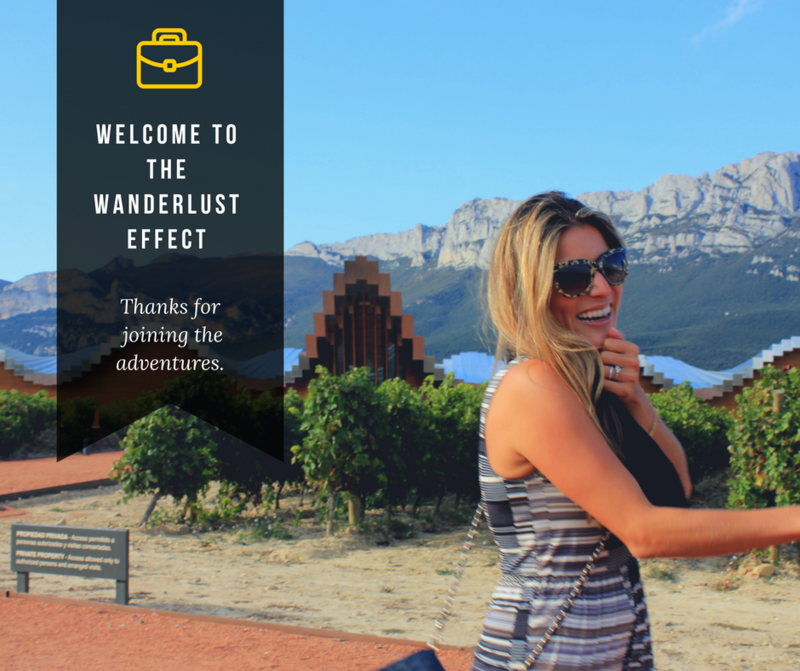 I’ll be sharing some thoughts on time management, and things to keep when wine tasting in La Rioja, so stay tuned if you’re working on your own trip to La Rioja in the future! Up next: Our second day of wine tasting in La Rioja with Ikusnahi Tours! Have you been wine tasting in La Rioja? What bodegas were musts for you? A big thank you to Nadege for escorting us and making this day possible, and a huge thank you to all of the bodegas that hosted this delicious and educational experience for us!